Many have mentioned that Irene will just bring lots of rain, that it was really not much of a storm. Looking back at this storm you have to take into account not the strength of its winds but the overall size and impact this storm had on this entire area. Every river, creek and pond was over its banks, and on top of everything else, we were hit hard right in time for high tide. This first pics is is of Quig's Pizzeria -Grille in Hatbro PA. 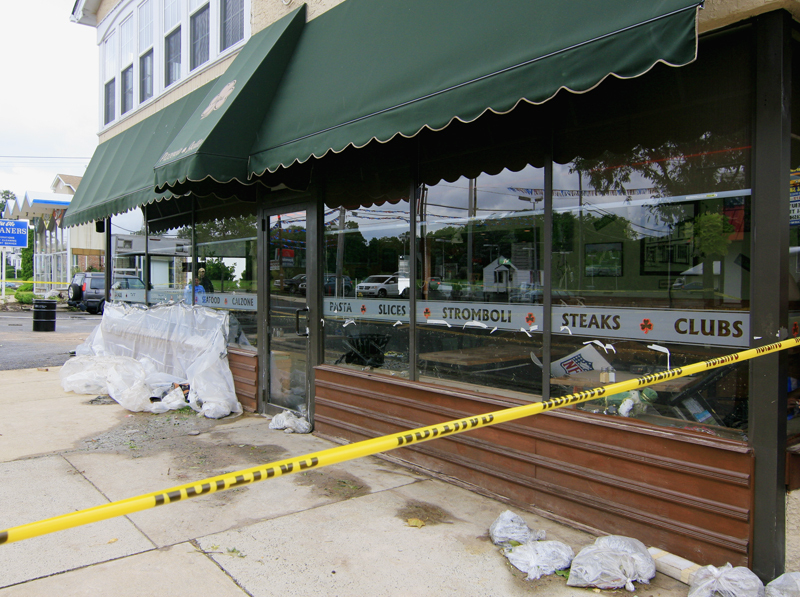 This establishment is located close by the Pennypack Creek which had to be at least 8 feet over its banks. 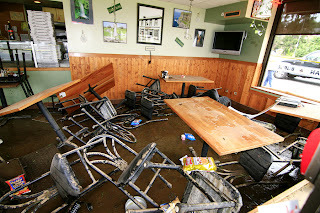 Mud was everywhere and you can see the force of the running water had on the tables and chairs inside. You can see the sand bags and plastic that was used to try to keep the raging waters out. Rains heading in our area from the west . Most weather reports did not indicate this. I was driving home from work and have been noticing how the leaves have started to change, I will try to upload some pics soon. Storm Chasers Premieres September 25 at 10pm E/P! If a tornado was approaching, would you know what to do? Tornadoes are the most violent atmospheric phenomenon on the planet. Winds of 200-300 mph can occur with the most violent tornadoes. * IN HOMES OR SMALL BUILDINGS: Go to the basement (if available) or to an interior room on the lowest floor, such as a closet or bathroom. If you do not have an interior room, go to a room on the side of the structure farthest away from the approaching tornado, typically the east side. Wrap yourself in overcoats or blankets to protect yourself from flying debris. * IN SCHOOLS, HOSPITALS, FACTORIES, OR SHOPPING CENTERS: Go to interior rooms and halls on the lowest floor. Stay away from glass enclosed places or areas with wide-span roofs such as auditoriums and warehouses. Crouch down and cover your head. * IN HIGH-RISE BUILDINGS: Go to interior small rooms or halls. Stay away from exterior walls or glassy areas. * IN CARS OR MOBILE HOMES: ABANDON THEM IMMEDIATELY!! Most deaths occur in cars and mobile homes. If you are in either of those locations, leave them and go to a substantial structure or designated tornado shelter. The picture below illustrates clearly what a violent tornado can do to a car. * DO NOT HIDE UNDER AN OVERPASS!!! People in the May 3rd, 1999 Oklahoma City tornado were badly injured and killed doing this very thing. * DO NOT GO OUTSIDE TO LOOK FOR THE TORNADO! Only the people in the business to do so should be observing the tornado. Spotters, storm chasers, law enforcement, etc. are trained to know how to stay out of the path, and when to take cover. * WHEN INSIDE: If ordered to evacuate or if rising water is threatening, leave immediately and get to higher ground! * IF CAUGHT OUTDOORS: Go to higher ground immediately! Avoid small rivers or streams, low spots, canyons, dry riverbeds, etc.. Do not try to walk through flowing water more than ankle deep! Do not allow children to play around streams, drainage ditches or viaducts, storm drains, or other flooded areas! * IF IN A VEHICLE: DO NOT DRIVE THROUGH FLOODED AREAS! Even if it looks shallow enough to cross. The large majority of deaths due to flash flooding are due to people driving through flooded areas. Water only one foot deep can displace 1500 lbs! Two feet of water can EASILY carry most automobiles! Roadways concealed by floodwaters may not be intact, as the picture below shows the aftermath of a flood. * Avoid using the telephone (except for emergencies) or other electrical appliances. * Do not take a bath or shower. * Go to a safe shelter immediately! such as inside a sturdy building. * A hard top automobile with the windows up can also offer fair protection. * If you are boating or swimming, get out of the water immediately and move to a safe shelter away from the water! * If you are in a wooded area, seek shelter under a thick growth of relatively small trees. * If you feel your hair standing on end, squat with your head between your knees. Do not lie flat! * Avoid: isolated trees or other tall objects, bodies of water, sheds, fences, convertible automobiles, tractors, and motorcycles. Hydroplaning can occur to your vehicle when water on the roadway accumulates in front of your tires faster that the weight of your vehicle can push it out of the way. Your vehicle will actually ride up on top of the water, much like a water skier on top of a lake. In this very dangerous situation, your tires no longer have any contact with the road surface and you will no longer have control of your vehicle. This usually happens at higher speeds, over 40 miles per hour, while going through water standing on, or running across the roadway. The top photo shows an SUV driving fast through a large pond on the road. The danger of hydroplaning in this situation can be very high. Let&#39;s examine the second photograph showing an SUV tire coming straight at you to understand a little more about what&#39;s going on with hydroplaning. Notice the water running across the road. The surface of tires (yellow line) must move that water out of the way in order for the tire to stay in contact with the pavement. The tire will squish the water out the sides (red arrows) and backwards within the tire treads. If you are moving slowly, this is not a problem. If you are moving fast, and if the water is deep enough, the water will not be moved out of the way fast enough and it will build up in front of the tire. At this point your entire SUV will float on top of the water (third photograph). It is often hard to tell when you are hydroplaning. The rear end of your vehicle may feel a little squirrelly (loose, giving you the sensation that it has moved to one side or the other), especially in a high crosswind. The steering may also suddenly feel loose or little too easy. If you sense that your vehicle is hydroplaning, DO NOT HIT THE BRAKES - YOU WILL SKID OUT OF CONTROL. Take your foot off the gas and steer straight ahead until the vehicle slows to the point where the tires come back into contact with tt he pavement. The best defense against this problem is to reduce your speed significantly anytime there is standing water on, or water running across, the roadway. If it is raining very hard, you need to drive even slower to give your tires the time they need to move the large volumes of water out from in front of them. Note: even if you may driving in a 4 wheel drive vehicle, that won&#39;t help one bit once your vehicle tires lose contact with the roadway. Control of your vehicle depends entirely upon the action of your tires on the pavement. Try to imagine yourself in midair turning right or left, or hitting the brakes or gas pedal. It should be obvious that nothing is going to happen! Same results when in a hydroplaning situation. Watch the road ahead for standing or running water. You can also pay attention to the spray being kicked up by the cars in front. If it suddenly increases (bottom photo), it is possible that the driver has hit a patch of water that could cause hydroplaning. WARNING: No one can tell you at exactly what speed and water depth your particular vehicle will start to hydroplane. There are complicated formulas used by scientists to figure this out and they depend on vehicle weight, water depth, tire tread type, and even the density of the water among other things. Suffice it to say that your vehicle will hydroplane if you are going fast enough in deep enough water. Hydroplaning information was used by permission from: SUVONE.com. There is info here that I did not know about and I strongly suggest you spread the word. People have died in recent storms due to crossing flooded roads in the surrounding areas of Philadelphia. Please see a few weather widgets that are added. As most of you know we are in the beginning of the changeover to fall, tonight temps are dropping to the mid forties. at 12:54am I see it at 49 degrees and dropping, barometric pressure is steady at 1023 mb. Tomorrow I will share a few pics with background infromation. Sorry this was not posted tonight as I just set up the blog with ads. Please explore the featured ads found in the blog page.. I will start by sharing a little about myself and why I obsess about monitoring weather conditions. I have lived in South America where I found myself within the effects of the El Nino Southern Oscillation. (ENSO) I will share some stories of the rains and flooding that I had encountered when I lived in Ecuador. Other weather events that I remember growing up in PA also helped to shape my future interest in monitoring and studying about our climate. I have done some reading about El Nino and I know that some of the main effects of this cycle has to do with changes in ocean temperature. On top of this effect, we are aware of man's influence on climate change, we only have hope that with small changes that we are making may help to ease our impact on the environment. I am a serious Amateur Photographer and I want to share examples of my work. My aim is to document storms, and to learn more about Meteorology. At some point in the future I will volunteer to be a weather spotter for Skywarn.